THUNDERSTORMS ARE produced by cumulonimbus clouds and include thunder and lightning. They form when the troposphere is unstable or conditionally unstable for a large portion of its depth and may have tops of 40,000 to 50,000 ft (12,000 to 15,000 m) or higher. In addition, thunderstorms require a source of atmospheric moisture and a “trigger”—a feature that initiates upward vertical motion in the atmosphere. Thunderstorms are built of units called cells. A mature cell contains an updraft and a downdraft. Single cell thunderstorms may be only 2 to 3 mi (a few km) across and multiple cell thunderstorms may be a few hundred miles across. Cells have one of two types of structures: ordinary cells and supercells. Multiple cell thunderstorms may contain cells of both types. A thunderstorm with a single ordinary cell is known as an air mass thunderstorm. These storms are not known for producing severe weather but do so on occasion. An ordinary cell goes through a life cycle that consists of three stages. The first stage is called the cumulus stage and has only an updraft. Bubbles of warm air rise through the lower troposphere and liquid water condenses when their temperatures cool to their dew point. A cumulus cloud is present that has not grown large enough to produce precipitation that can fall through the updraft. As the cumulus cloud grows taller, the hydrometeors grow larger and can begin to fall through the updraft. This precipitation drags surrounding air down with it. In addition, on the edge of the cloud, the liquid water mixes with unsaturated air. Some of the liquid water evaporates, cooling the air. This cooler air is negatively buoyant and encourages downward motion. Some precipitation in downward moving air leaving the cloud through its bottom will evaporate, further cooling the air in the downdraft. When the precipitation reaches the Earth’s surface, the storm enters its mature stage. As the cool downdraft contacts the Earth’s surface, it spreads out away from the storm. Its leading edge forms a gust front or an outflow boundary. As the downdraft air moves away from the storm, it cuts off the rising bubbles of air that originally started the storm. When the downdraft has spread through the entire storm and no updraft is left, the storm enters the dissipating stage. The storm weakens and begins evaporating from the bottom up. This entire life cycle lasts 30 to 60 minutes. The updraft of a supercell thunderstorm rotates. This characteristic distinguishes it from the ordinary cell thunderstorm. The rotation is not influenced by the Coriolis force and may go in either direction but cyclonic circulation is preferred in North America. The supercell forms in an environment with considerable vertical wind shear. The updraft and downdraft will tilt and twist as they move through the storm. The updraft and the downdraft remain separated so that the downdraft does not cut off the updraft. Thus, a single supercell storm may last for several hours. The updraft is strong and precipitation does not have time to form within it. The updraft of a supercell storm shows up as a weak echo region when observed by radar. The rotation of the updraft pulls some of the storm’s precipitation partially around it. This forms a feature known as a hook on the radar. The end of this hook is the most likely spot for a tornado to form. Supercell thunderstorms are frequently associated with severe weather. Thunderstorms most commonly exist in groups of multiple cells. Large multicellular groups are known as mesoscale convective systems (MCS). Ordinary cell thunderstorms in a multicellular group still last only 30 to 60 minutes. But new thunderstorm cells are formed to replace the ones that dissipate so that the multicellular storm may last several hours and, on rare occasions, even days. Multicellular thunderstorms may also contain supercells as well as ordinary cell thunderstorms. Thus, it is not unusual for multicellular storms to produce severe weather. If these storms move slowly, they may produce very heavy precipitation and flash floods. Multicellular storms take two different forms. In one, the cells are arranged in a line and the storm is known as a squall line. In the middle latitudes, the most typical place to find a squall line is in advance of a cold front. In the other, the storms are arranged in a somewhat circular configuration. Some storms with this configuration are known as mesoscale convective complexes. These storms are defined by specific criteria from infrared satellite images. In general, they are larger and longer-lasting storms. Both types of multicellular storms may occur in the tropics as well as the middle latitudes. Electrical discharges known as lightning are what make a thunderstorm. There can be no thunder without lightning, but someone who hears thunder may not necessarily see the lightning that caused it. 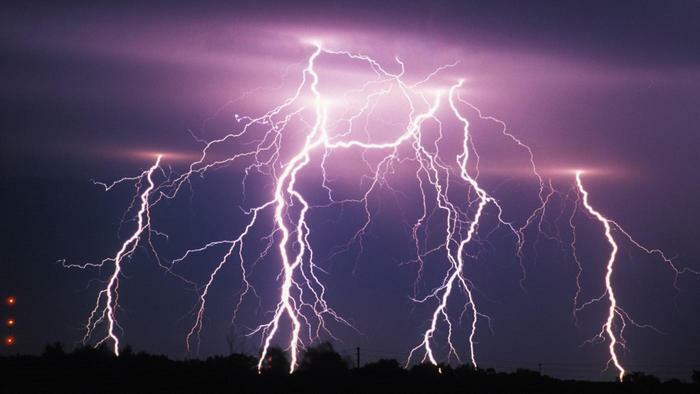 Since the lightning flash travels at the speed of light and thunder travels at the speed of sound, the observer can estimate the distance between himself or herself and the lightning stroke. The observer counts the seconds between seeing the lightning and hearing the thunder and divides by five to get miles (three to get kilometers). Most lightning takes place within a cloud or between clouds and is commonly known as sheet lightning. Cloud to ground lightning can cause fires and injure or kill people and animals. Precipitation amounts from thunderstorms range from very light to excessive. Amounts that are not excessive are generally beneficial. Lightning carries the potential for danger. Tornadoes, hail, and strong winds often cause serious damage and may cause deaths.